Cathay Pacific Asia Miles has announced some changes to its award chart that represent devaluations in premium cabins on long-haul round trip routes. The changes for flights on Cathay Pacific aren’t catastrophic at first glance, though there aren’t any significant bright spots in terms of redemptions. Some of the devluations on the oneworld multi-carrier chart are quite significant. Changes are set to take effect on June 22nd, 2018. The email from Cathay Pacific notes that “you will be able to redeem all Economy Class flight awards with fewer or the same miles”, which isn’t much of a consolation prize. The “good news” is that the majority of the devaluation comes in round trip rates. Currently, Asia Miles charges more than 50% of the round trip rate for a one-way flight. A number of the devaluations come in raising the round trip rate to become double the cost of a one-way. They provide the example of Hong Kong to New York: current one-way pricing of 85K stays the same, whereas a round trip goes from 145K to 170K. There are some minor improvements to be found. For example, one-way first class between Hong Kong and New York is decreasing from 130K one-way to 125K one-way, though that’s hardly exciting as American charges 110K on that route and Alaska charges 70K (and allows you to stopover and then continue on within Asia for the same price). Of course, Alaska and American depend on partner availability — but the point is that this type of change isn’t terribly exciting. Here is the new award chart for travel booked starting on June 22nd, 2018. And here is the old award chart, which is still in effect for bookings made before June 22nd. As you can see, rates for zones 1-4 do not change, but the longer haul routes beyond Zone 4 see changes, some of which are pretty significant. For example, Zone 8, which covers a trip of 10,001 to 14,000 miles, will see an increase in the cost of a first class award from 155,000 miles to 220,000 miles. That’s an increase of 65,000 miles — that’s an increase of about 42%. Youch. Business class increases are less extreme, but all of the routes beyond Zone 4 still see increases. That post points ouy a number of the sweet spots, some of which will change next month. While some increases aren’t terrible, you can save some miles by redeeming sooner rather than later. As a reminder, Asia Miles is an Amex transfer partner and Citi transfer partner (and will be a transfer partner of the combined Marriott/SPG program), so it is pretty easy to put together the points necessary for an award. Alaska and AA redemptions on Cathy remain unchanged, right? Correct. 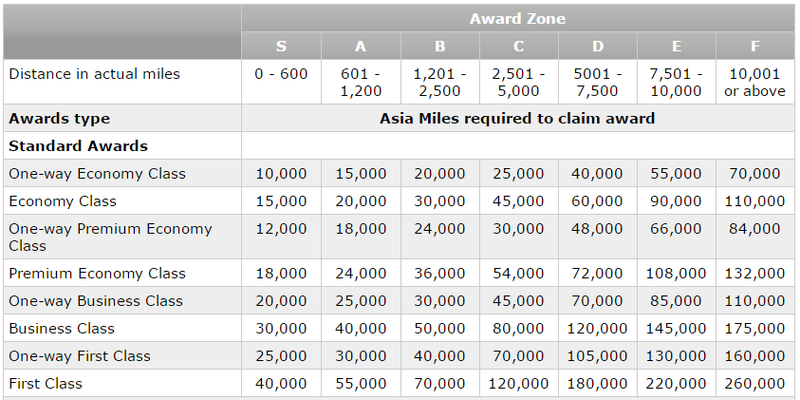 This is a change for Cathay Pacific Asia Miles redemptions. It sounds like a good move then for AA/Alaska miles users then. If there are 20% more seats and premium seats are more expensive for Cathay holders, it seems like that means it’d be easier to find and book Cathay as a partner award. At least until Cathay forces partners to raise their redemption rates. Nick: Come August 1st, the combined SPG/Marriott program will have Cathay Pacific as a transfer partner, also. Probably should add that to your last sentence. Will OW partners now use only the OW chart when flying single carrier or CX+OW? Currently a ticket like that would fall under the pricing of the first chart shown above, and only a ticket with two OW carriers (not including CX), or two OW+CX uses the OW chart. Is that changing? From my reading of the information it looks like Cathay is going to add one or more new charts for single-partner awards, but they haven’t released that info yet aside from a few examples.